Imagine if you had a traumatic brain injury for a moment. Okay, I know this isn’t usual JoggingJeans.com lightheartedness, but bear with me for a second. Imagine if you had a traumatic brain injury. What would you do? I know I would not take on the feat of running from one side of Canada to the other in order to raise awareness for Traumatic Brain Injury Survivors, that is for sure. But, David McGuire, that is what he did and called it a “Run to Remember.” And this is AFTER David’s family was told that he may never walk or talk again. One year after his injury, he ran his first marathon. And soon thereafter pulled off the amazing feat of running a marathon a day across Canada, departing from St. John’s Newfoundland and completed his amazing feat 8 1/2 months later in Victoria. David running along the road. And who does he see up ahead? Providing some company to David during his run. 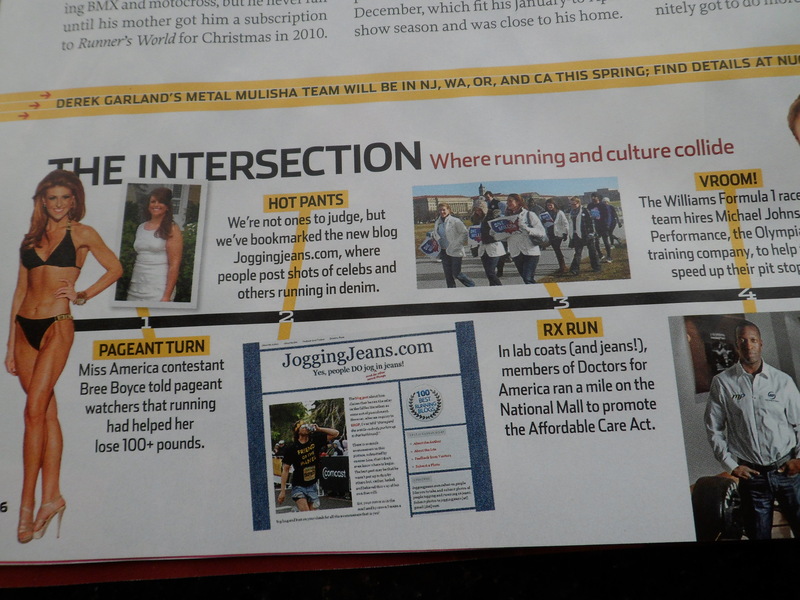 Our fifth and final reason why people jog in jeans: they are the most awesome humans alive. Click picture for more details about their awesomeness. You know when someone recommends [enter item here] and says, “Oh, you will like this”? And then soon thereafter another person says, “Hey, [enter your name here], you need to check out [enter same item here]”? And then a third person says, “[enter same item here] is right up your alley”? Then you finally check out [enter item here], and are pissed at yourself that you didn’t listen to the first person that recommended it and you feel like you’ve been missing out? The latest time that the above has happened to me is with the blog Steve in a Speedo?! Gross! To all you “friends” that knew about this little treasure trove of awesomeness and DIDN’T tell me about it, I’m re-evaluating our so-called friendship. Seriously. Go read. Don’t wait. I guarantee that you’ll enjoy the musings of a seemingly great guy – athlete, father, funnyman, and wearer of…um…jorts during races. Tagged costume, jean thong, jeans, jogging, jorts, race, Reindeer Run, running, running in cold, running in snow, Steve in a Speedo?! Gross! Ready to have your heart warmed? I feel very fortunate to be the one to share with you the story of a young man named Lazar Rišar. Lazar is 17 years old and lives in Sombor, Serbia. His family consists of his father, step-mother, and 10 siblings. He is uneducated (as in he can only write is name and read basic numbers). His family is very poor. One day this past May, when he was leaving church, he noticed activity in the town square. As he approached the crowds, he saw people handing out race numbers. He took one for the 2K Fun Run. However, as the race continued, he decided to keep running with the half-marathoners. He finished in 2 hours 22 minutes. 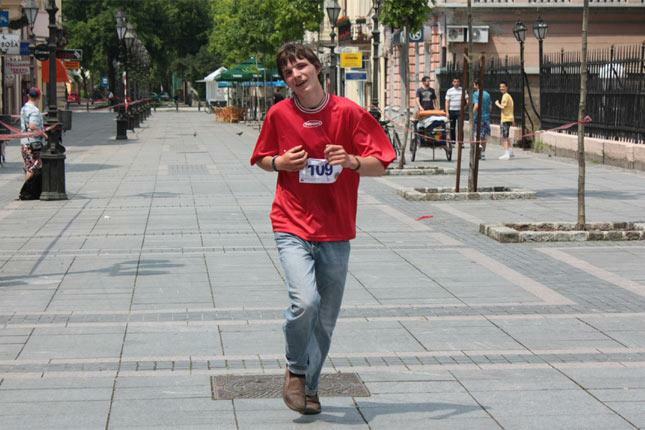 The race organizers named him the “moral winner” of the 32nd Sombor Marathon. He had no training except that he usually ran the 2 miles from the periphery to the center of his town. His diet consists of meals provided by the Red Cross soup kitchen. No pre-race carb loading. No protein bars. He had no special running gear. 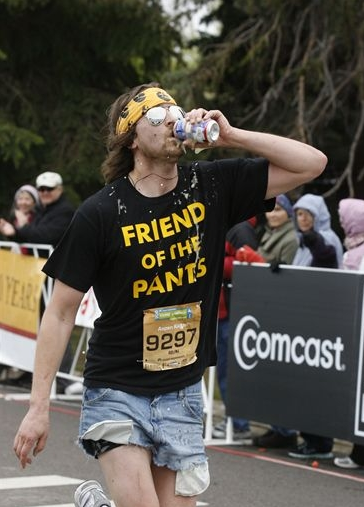 In fact, he ran the race in JEANS and very worn casual shoes. After his story was made public, the Sports Association of Sombor gave him a pair of running shoes. He was grateful but stated that he would prefer the opportunity to work and earn them on his own. How great is this kid? The JoggingJeans.com Awesomeness Award has been officially bestowed upon Lazar Rišar. Don’t even bother nominating someone else. It is Lazar’s award. Forever. I must give a BIG thanks to Milica who first introduced me to Lazar and translated the Serbian articles so I could have all the details. Please spread the word about this great kid! 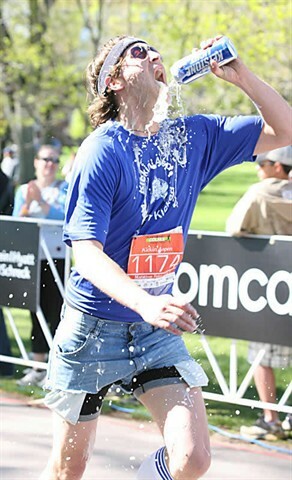 JoggingJeans.com has an Awesomeness Award that has been bestowed upon this guy. 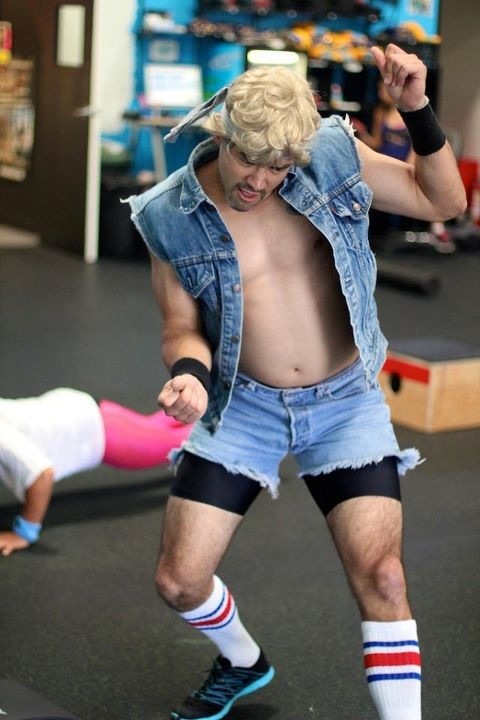 We have a contender for the award who, although he is not running, is participating in a fitness activity that could be argued to be tougher to do in jeans than running: CrossFit. But Dan does look AWESOME in his denim outfit, doesn’t he? Thanks for the photo, Dan! There is so much awesomeness in this picture, submitted by runner Lisa, that I don’t even know where to begin. The best part may be that he wasn’t put up to this by others but, rather, looked and behaved this way of his own free will. Sir, your crown is in the mail and by crown I mean a big hug and kiss on your cheek for all the awesomeness that is you!